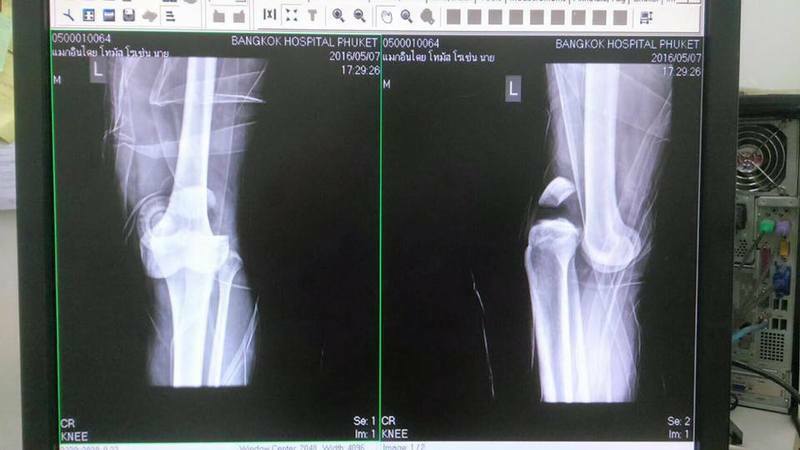 PHUKET: The international wakeboarding community is rallying to raise funds for Phuket’s own Mackinthai Thomas Rosen, who had his left leg amputated below the knee after an accident during an Asian Cup competition in Phuket in May. Mac had torn all the ligaments in the knee and his left leg had suffered severe artery damage, and complications with blood flow to the foot. The Phuket-born 25-year-old known as Mackie, or just Mac, to his friends suffered the devastating injury on May 7, the first day of the IWWF Asian Cup held at Phuket Wake Park in Kathu. “I was trying to throw an air trick to complete my competition round. I went too high in the air, lost control and landed heavy with a straightened left foot into the water,” he told The Phuket News. Mac is no stranger to such international competitions. He is a professional wakeboarder and a national team rider for Thailand. He won silver for an individual event and gold for a team event at the Asian Beach Games held in Phuket in 2014. Last year, he represented Thailand in Taiwan and Shanghai, and competed in wakepark world series events held in Thailand. At the time of his fall, Mac was representing Thailand in the IWWF Asian Cup 2016 and Phuket Open International CUP 2016 held at Phuket Wake Park under the auspices of the International Waterski & Wakeboard Federation (IWWF) and the Thailand Extreme Sports Association (TESA). After the accident, Mac was rushed to Bangkok Hospital Phuket by a hospital ambulance on standby at the event – as required for events under the IWWF and TESA. “Honestly, I thought I just dislocated my left knee and all the doctors had to do was to put my knee back and I just needed a couple of months to heal,” he said. The bad news was that Mac had torn all the ligaments in the knee and his left leg had suffered severe artery damage, and complications with blood flow to the foot. “My left knee was amputated on the fifth operation and the sixth operation was when the doctors had to cut and clean away all the dead tissue,” Mac explained. Now, while overcoming the pain – phantom and real – and coming to grips with his own mobility, Mac faces a mountain of medical bills which have spiralled to over a million baht. To this, Mac has found strength in support with scores of people doing their best to help him. TESA Executive Director Phaladisai Jaitaskul told The Phuket News, “The insurance coverage provided B400,000, but the medical bills even at the early stages were much more than B800,000. To raise the funds, Mr Phaladisai and fellow TESA Director Phuriwat “P’ Ton” Phattranonarnan launched the “Wakeboard Funding For Thai Wakeboarder” (WFFTW) Facebook page. The portal aims to raise funds for all wakeboarders needing help recovering from injuries, but right now their priority is Mac. “We have known and followed Mackinthai after the accident. We helped provide support for his treatment, and we have received support from the International Wake Park, Thai Wake Park, Zanook Wake Park and the IWWF,” Mr Phaladisai said. TESA also launched an online campaign to raise awareness of Mac’s plight, with more than 60 people, including youngsters, cutting off their hair and posting photos to show their support and reposting them under a the hashtags #24mackie. Phuket Wake Park was also quick to chip in. “Phuket Wake Park has donated B200,000 to TESA to help Mac. Now the whole team here is digging deep and calling on everyone they know to provide all possible assistance,” a company representative told The Phuket News via a statement issued through Facebook. “We will also hold a charity event to support Mackie, so everyone can take part. We have yet to sort out the details, but when we do, we will announce the event on our Facebook page. “We deeply regret what happened to Mackie and feel deeply for his family. We are working towards helping him and wish him the best with his recovery,” the statement said. Yet, the fight to pay the bills is far from over. Copies of Mac’s medical bills posted on the WFFTW Facebook page on Monday (June 14) showed more than B800,000 paid, from an outstanding bill levied by Bangkok Hospital Phuket of more than B1.2 million, and that is just the beginning. “There is still much to do, and the fundraising needs to be ongoing. We appreciate the efforts by everyone, but more needs to be done,” Rebecca Lek, co-founder of Anthem Wake Park in Thalang, where at the time of his injury Mac was Coach and Team Rider, with youngsters Luke and Ryan under his tutelage. Anthem provided support for a specialist doctor to take care of Mac at Ramathibodhi Hospital in Bangkok, and every few days different people from the park flew to Bangkok to help Mac and make sure he was never alone. To lift Mac’s spirits, the Anthem team all clippered their heads in a show of solidarity. “We want him to feel he has family looking after him, and that he has some control over the funds he will need,” Ms Lek said. “The fundraising will need to go on. Mackie will need time, attention and specialist care to recover fully, and we want to be there for him. People forget that a prosthetic leg does not last long and every few years, it needs to be replaced,” she explained. To this, the entire park staff are pulling together to raise funds for Mac. But more importantly, the funds raised will be deposited directly into Mac’s own bank account. “This is so important, not just so Mackie knows where the money is coming from, but also so he can make sure it is spent on what he needs the most when he needs it,” Ms Lek said. Since his ordeal, Mac’s messages have been deep with gratitude and simply inspiring. “I’m goin to flight (fight) and come back stronger even with 1 leg!” was the first message he posted on his own Facebook page after the amputation. Mac has lived in Phuket all his life and is a former student of Quality Schools International – Phuket (QSI-Phuket), and has been wakeboarding since 2003, when he was just 13 years, when he took up the sport at Phuket Wake Park in Kathu. “I just love the feeling of being on the water, being on a wakeboard,” he said. “I miss wakeboarding a lot and wish I can ride right now, and once I get fitted with my prosthetic leg, I want to be on my wakeboard immediately. “I feel really thankful to have so many people around me who genuinely care for me. I’d also like to thank everybody who came to visit me – and especially P’ Ton, who has been with me to attend to my needs every day when I was in Bangkok,” Mac said. IWWF Executive Director Paul Fong in a letter to The Phuket News noted, “This is the first injury of its kind that IWWF Asia has ever witnessed in competition. As in this case, IWWF Asia ensures that paramedics and ambulance services are available for sanctioned events and rescue personnel are in place. “As a matter of routine, all riders were advised by IWWF Asia, in advance, to take out private travel/accident insurance besides their health insurance, to include accidents arising during cable wakeboard competitions. The organisers, Phuket Wake Park, were only required to provide an ambulance and paramedics to be on standby throughout the event and during practice. “In a sport with such a strong emphasis on safety and with few serious accidents over the years, our IWWF team was shocked to hear of this very unusual medical issue which has made such an impact on a young and talented athlete. “We wish Mackinthai a quick recovery to good health and assure him that he will always be welcome to play a part in our sport. Although there are over 90 Federations affiliated to the IWWF, an injury such as this is a shock to all and we offer Mac all the support we can over the coming months. All donations to both accounts, no matter how small, are publicly thanked with photos receipts, from B500 to B10,000. P' Ton of the Wakeboard Funding For Thai Wakeboarder late this week urged all donations for Mac Rosen to be deposited directly into Mac Rosen's own account.